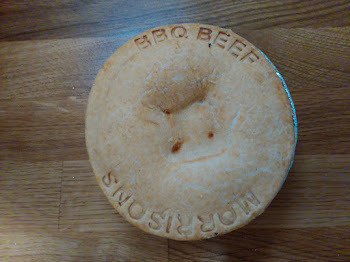 I decided to try something a bit different on Day Four of British Pie Week in the form of a Pulled BBQ Beef pie. Whilst it was different, I picked up this pie from the very familiar territory of the Pie Counter at Morrison's (see all 24 of our Morrison's reviews here). I always feel I have to have a look at the pie counter, even if I have a fridge already full of pies, I can feel it calling to me as soon as I enter the store. Like a massive celestial body, it attracts me with an irresistible gravitational pull. I thinj they recognise me now, they even gave me a crate of free pies at one point. I think what I am looking for are new flavours and one that stood out to me on a recent visit was the Pulled BBQ Beef pie. At a price of 2 for £1.50 they promised to be good value rather than spectacular, which is often the case for the Pie Counter pies. It was in the same shape and style as the Chunky Steak which is one of the best ones so I was hopeful it would be good. So far, so good but then the test came in the eating of the pie. Unfortunately this is where things started to go wrong. Cutting it open the filling clearly had the wrong Consistency as it all oozed straight out of the pie. There was also a lack of Content, revealing that the pie was mostly full of air. In some ways the lack of filling was actually a positive in this case because I didn’t really like the filling! Rather than a meaty gravy, the pie was mainly filled with something akin to Barbeque Sauce. I am not a huge lover of this sauce but American influence seems to be bringing it more and more into our food here in the UK. Hence I have been getting used, even enjoying it with the right food and in the right amount. However, the filling of this pie was certainly not the right place for the sauce. It would have been okay to add some to a regular gravy to give a slight taste of BBQ Sauce but this experience was like trying to squeeze a whole bottle of the stuff into your mouth! It reminded me of the Weatherspoon’s challenge we used to do where you had to eat as many sachets of sauce as you could until you felt sick. The sauce meant it was over-poweringly sweet and fruity and consequently there was no flavour from the beef. It could have been pork, chicken or even quorn and I wouldn’t have been able to tell. This was in part because there wasn’t much meat and it had disintegrated into each individual fibre. I am a fan of slow cooked meat but this was pushing the concept to destruction. There was nothing to get your teeth into. Fortunately the pastry tasted nice with the same biscuity crunch of the other Morrison’s pies in this range. However, it wasn’t enough to save this pie from a disappointing score, in fact the lowest score of all the Morrison's pies that we have reviewed! Colour – 4.0 out of 7 - Appealingly golden but with a tinge of light, rusty brown. Condition – 4.0 out of 7 – Mint condition without having a spectacular appearance, the lettering around the top denoted the flavour of the pie. Cost – 4.0 out of 7 – You don’t get much for 75p these days. Capacity – 2.8 out of 7 – Quite tall but full of air! Chewiness – 3.0 out of 7 – Nothing to get your teeth into. Content – 2.0 out of 7 – If you like necking a bottle of BBQ Sauce then you will love this pie. Consistency – 2.0 out of 7 – A gloopy mess and the filling didn’t go well with the pastry.